ECM Plus /London/ +++ Good Technology has acquired Copiun Inc., a privately-held company specialising in secure mobile collaboration. 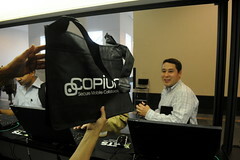 According to the company, Copiun’s products enable mobile users to access file shares, SharePoint or other document stores from anywhere without a VPN connection or firewall reconfiguration. Good said the transaction would extend its collaboration solution with Copiun’s secure mobile file sharing and data syncing technology to allow business workers to easily access, sync and share enterprise information from anywhere, at any time, using their mobile phone or tablet. According to Forrester Research, two-thirds of North American and European employees indicate that they work outside of their corporate office regularly, meaning that business leaders need programs that will keep their staff productive while on-the-go. Good Technology’s acquisition of Copiun enables mobile workers to securely access, collaborate, sync and share file server and SharePoint documents using a personal (BYOD) or corporate-liable device. Puneesh Chaudhry, CEO and co‐founder of Copiun said: “Copiun TrustedShare helps maximise the value of enterprise customers’ significant investments in SharePoint and file server deployments, while making employees more productive and protecting the enterprise against the very real and mounting data security risks in today’s increasingly mobile world.” Chaudhry will join Good Technology’s leadership team, overseeing the TrustedShare product line. Copiun personnel will become full-time employees of Good Technology and the Copiun headquarters in Marlborough, Massachusetts will become a Good Technology office. The transaction is expected to close in September and is subject to customary closing conditions. Financial terms of the acquistion were not disclosed.